What if you conquered America’s #1 fear? Yet businesspeople often squander or avoid these pivotal moments in the spotlight. Instead of running for the podium, they break for the exits. “Fear to Fun: How to stop freaking from public speaking” changes that equation. This dynamic, interactive seminar transforms public speaking from an anxiety-provoking chore into a powerful tool your group can wield to boost their impact on, and value to, their organizations. “Fear to Fun” is unique in both content and style. It aims squarely at the thorniest area of public speaking, and delivers value your audience can use right away. 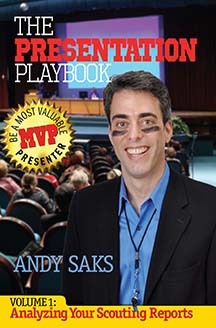 Tying it together is speaker Andy Saks’s fun, engaging presentation style. Emphasizing discussion and stories, he generates a relaxed atmosphere that fosters true understanding. They’ll learn, they’ll laugh, and you better believe they’ll remember. Armed with an appreciation of public speaking anxiety and the tools to overcome it, your audience will leave ready to face the microphone with confidence and—imagine this—joy. So take the first step to conquering America’s biggest fear, and watch it change your life. Contact Andy directly to book “Fear to Fun” for your conference, retreat, meeting, or other special occasion today! WOULD “FEAR TO FUN” FIT YOUR FUNCTION? Career Center of Lowell, Mass. presenting to my Strategy class at the Brown Executive Masters in Healthcare Management program. His talk on overcoming fear and other barriers to public speaking resonated with the class and were right on target! laughing and joking during his “Fear to Fun” program about public speaking. Turns out you can thank Caveman Dave and his run-in with a bear for your dry mouth, sweaty palms, and lapses in memory when you get up to speak in front of a crowd. Andy’s tips and techniques for overcoming this evolutionary disadvantage are fun, practical, and easy to use. Andy, thanks for a dynamic and engaging program! You are charismatic, you know your presentation material, and you carry it out it in such a fun but yet professional manner. Group members and staff attendees were buzzing about how excellent the presentation was. We all were floating on high for quite sometime after.